I am delighted to have this guest post about the mysterious Marfa Lights from my friend, C.M. Mayo! This is an excerpt from the transcript of the 7th podcast in my projected 24 podcast series, “Marfa Mondays,” which is apropos of my book in-progress, World Waiting for a Dream: A Turn in Far West Texas. If you haven’t heard of Marfa, let me fill you in on the basics. Named after a maid in a Dostoyevsky novel, it’s a speck of a town in the middle of the sweep of Far West Texas, part of an area the Spanish called the tierra despoblada, and later, somewhat frighteningly, the Apachería. Even today with the railroad and the highway, and the recently internationally famous art scene, not a lot of people live in Marfa. 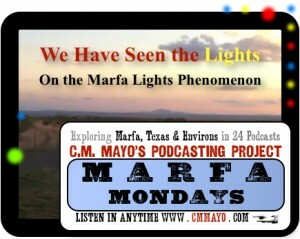 But it seems almost everyone who does has seen and has a shiver-worthy story about the Marfa Lights. As I set my shoe on the dirt, I saw that it was surrounded by a scattering of something silvery: quarters. I have found many a penny on the sidewalk, and few dimes over the years, but this was several dollars worth of quarters. I gathered them up. I would have thought him barking mad except that, I too saw the lights and they were unlike anything I had ever seen. I climbed up on the other picnic table for a better view. There were a couple dozen little lights dancing on the flats and up in the foothills. They must have been miles away— maybe around the town of Shafter? Shafter is on the way to Presidio, the main town on the US-Mexico border in these parts. They looked like car lights, but they were not just white and red, but green, blue, yellow— nor they did they move like car lights. Up they bounced! No helicopter I ever saw moved that fast, that straight, that high. Whimsically, the little lights shot left, then right, sliding horizontally, apparently along the ground, as if on greased rails. They blinked on, then off. Then on— irregularly, not like any mechanical signal. A yellow one went left; red up, blue blinked. Green stretched to divide like a piece taffy, in two. And just when I thought um, maybe those are car lights? Whoom, one would shoot up straight into the air, turn a different color, and blink off. As we pulled out, that man had stopped shouting, but he was still standing on top of the picnic table, transfixed. After dinner in Alpine, my sister and I drove back to Marfa in an ink-black night. We passed a few cars, a truck. Then what I thought was a motorcycle came toward us. A white, round light— a headlight, right? There was something odd about it, though, and then behind, in a line, came several others. A motorcycle convoy? At this hour? The parade of white lights swept by us and, I swear, I felt our car levitate. Then it was dark again and all I could see were our car’s own headlamps casting forward onto the highway. That was when I realized what was so odd about those… motorcycles. Those lights had not cast light forward onto the pavement as a vehicle’s headlamp does. They were uniformly glowing orbs. A line of orbs moving along the pavement at what must have been at least 60 miles per hour. “Did you see that?” I said to my sister. We ate the next night in Fort Davis. When I parked the car on the main street, I opened the door, and there, shining in the gutter, was another splash of quarters, several dollar’s worth. And on the way to Marfa that night, out in the middle of the desert, heading off at a right angle from the highway, I saw what I took to be the tailights of a truck. But suddenly those two red lights, whoom, flew apart and— I don’t know what, I just kept driving. My sister didn’t see that, either. Does this all sound like a tall tale? I’m telling you exactly what I remember experiencing; but whatever you think of that, I can assure you that if you go to Marfa and ask politely, you will find that eyewitness accounts of the Marfa Lights very much like my own and many, indeed, far stranger, abound. As a souvenir of that visit back in the late 90s, I bought a little stapled-spine book by Judith M. Brueske, PhD, The Marfa Lights: Being a Collection of First-Hand Accounts by People Who Have Seen the Lights Close-Up or in Unusual Circumstances and Related Material, second revised edition, published in 1988 by Ocotillo Enterprises. It turns out that the lights have been regularly witnessed and reported since the 19th century, mostly in the Marfa area, but throughout the desert, on the other side of the Rio Grande, south into Mexico and even as far northwest as New Mexico— though the ones I heard about there, in the mountains outside Alamogordo, from two different eye-witnesses, were red pinpricks that would float up close to one’s face and seemed to possess intelligence. The Marfa Mystery Lights are visible on many clear nights between Marfa and Paisano Pass as one looks towards the Chinati Mountains. The lights may appear in various colors as they move about, split apart, melt together, disappear and reappear. Robert Reed Ellison, a young cowboy, reported sighting the lights in 1883, he spotted them while tending a herd of cattle and wondered if they were Apache Indian campfires. Apache Indians believed these eerie lights to be the stars dropping to the earth. Many viewers have theories ranging from scientific to science fiction as they describe their ideas of aliens in UFO’s, ranch house lights, St. Elmo’s fire, or headlights from vehicles on US 67, the Presidio highway. Some beieve the lights are an electrostatic discharge, swamp gases, moonlight shining on veins of mica, of ghosts of the Conquistadors searching for gold. As explanation as to why the lights cannot be located is an unusual phenomenon similar to a miracle, where atmospheric conditions produced by the interaction of cold and warm layers of air bend light so that it can be seen from afar, but not up close. The air was warm enough to go without a sweater, but comfortable and the landscape, so vast and otherwordly, the way the sky blanched to lemon and to the southeast, the jagged profile of Cathedral mountain turned luscious shades of chocolate and lavender. To the south, the massive bulk of the Chinatis darkened to a plum-like purple. A few stars began to wink. We waited. I told my husband the eerie coincidence of finding those quarters, two days in a row, both times right by my foot when I opened the car door, and about that man on the table shouting, OH MY GOD. More people arrived. A family tumbled out of their RV; a couple from a sedan; and from a battered truck, a woman who commenced to set up an expensive-looking video camera. We meandered up and down the deck. We peeked at the horizon through one of telescopes. We meandered some more. We looked again through another telescope. We made small talk. The woman with the camera said she’d captured some lights on film just last week. She said she had a relative who’d lived out there in a lonely ranch house and he’d seen blue lights, but he closed the curtains— didn’t want to see, didn’t want to know. The air coolled. The mountains sharpened into near-black silhouhettes. In more than an hour, we had seen no lights other than the stars and one that was constant: a ranch light. My husband, he wanted to go to town and get dinner, so that was what we did. I could see the scene at Thanksgiving: he and my sister rolling their eyes. In the Marfa Book Company I found a copy of Hunting Marfa Lights by James Bunnel, which was published in 2009. Two things about this book caught my attention: First, that the author, who grew up in Marfa, is an engineer with quite a resume. Among many other things, he was a member of the launch team for all manned Apollo launches from 1968 to 1973 and he retired from BAE Systems as Director of Mission Planning Systems for Air Force Programs. Second, Bunnel went after with the Marfa Lights with a rigorous methodology, superb equipment, and relentless determination. One time, very early in the morning, when he was driving a school bus from Marfa to Presidio, he saw in the rear view mirror that a big orb had appeared on the highway. It followed the bus, and then it came closer… And then it moved inside the bus. “And the children?” I asked. I said, “wow.” And I sure did wish I’d had the presence of mind to record that. In the Marfa and Presidio County Museum, I asked Marfa native Berta Sánchez, had she seen the lights? And also in Marfa, when I was interviewing Paul Graybeal, owner of Moonlight Gemstones, for last month’s podcast, I asked him what lights had he seen? So what do I think the Marfa Lights are? At this point in time… an invitation to wonder. 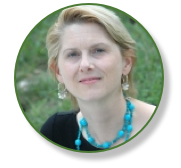 Thanks so much, John, it is an honor to guest-post on your blog.